Though the proliferation of events has made attendance a year-round possibility, I think of spring as the official beginning to the festival season. Though Ultra and Beyond Wonderland have passed, for EDM fans that means the Electric Daisy Carnival series will be sprouting up across the American landscape. 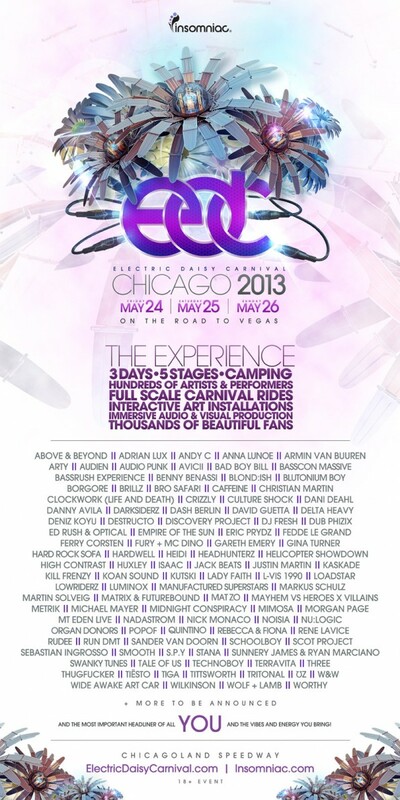 It’s newest stop, EDC Chicago, will be the first time the carnival travels to the Midwest, as Insomniac and its charismatic leader Pasquale Rotella, who was just named the most powerful person in EDM by In The Mix, continually seek to improve and expand the event. For Memorial Day Weekend (May 24 – 26) in Chicago, expect what the company does best: creating an immersive environment that not only showcases the music but transports you to another world. Enjoy art installations, performance art, and carnival rides all while listening to your favorite DJs spin. Speaking of DJs, the talent ranges from superstars Tiesto and Armin van Buuren to heavy-hitters Quintino and W&W. Satisfying the deep house & techno fans is Justin Martin, Huxley, L-Vis 1990, and Tiga, all of whom possess some of the most unique sounding styles in their productions. The Dirtybird player, Justin Martin, will no doubt be an entertaining set with garage infused deep jams like his latest titled "Wheelgunner". Tiga and L-Vis 1990 might be a surprise inclusion but if you're looking for something different than the usual big room, make sure to check out these techno heavyweights. Some more names to add to the bunch include Blond:ish, the two female Brits who's deep melodies, much like Tale of Us, add some beauty to a beast of a lineup at EDC Chicago. Bridging the gap are the godfathers of moombahton, Nadastrom, as well as the always entertaining Tittsworth. Since everyone knows moombahton was only the tip of the iceberg for slowed down club bangers, EDC has brought in some of the biggest names in trap including the mysterious UZ. Adding to the trap craze this year will be Mayhem vs Heroes x Villains. There's been a definite crossover in the last few years between the club and the street, and what better way to celebrate this than at one of the biggest festivals this Memorial Day weekend. Swedish producer Eric Prydz has been an artist who has gained a worldwide fan following by remaining elusive from the spotlight. After moving to Los Angeles a few months ago and seemingly getting over his fear of flying, Prydz has slowly risen out of the shadows to approach the spotlight that has been awaiting him. Dawning his show EPIC Radio and keeping his strict itinerary of IDs, Prydz's following is made up of dedicated fans who study his music. Because of just that, his performances the inaugural EDC Chicago brings some immediate credibility to the third spawn of Insomniac's festival franchise. A welcome addition to the lineup will be a number of hard dance artists, like Headhunterz, Kutski, and Technoboy, all three of whom won top spots at the Hard Dance Awards this March. One of my absolute favorite artists from this genre, brotherly duo Matt and Scott Harris who comprise Organ Donors, will also be playing. If you can stomach the beats, I highly recommend you see these guys who often play a blend of more popular electro progressive along with hard tracks on their radio show. One of the radio shows I always make time to listen to: Markus Schulz’s Global DJ Broadcast. The German-American electronic producer never fails to disappoint with energetic sets, featuring the newest trance tracks that take you on a journey from start to finish. Last year his work with fellow EDC Chicago headliner Ferry Corsten on “Loops & Tings”, an epic, ever-climbing track with trilling synth riffs, became one of my favorite trance anthems of the year. This week will see him begin his Scream Tour, traveling across the U.S. to over 20 destinations. Have no fear. He will have plenty of time to prepare something special for EDC Chicago, as the tour ends the week before.